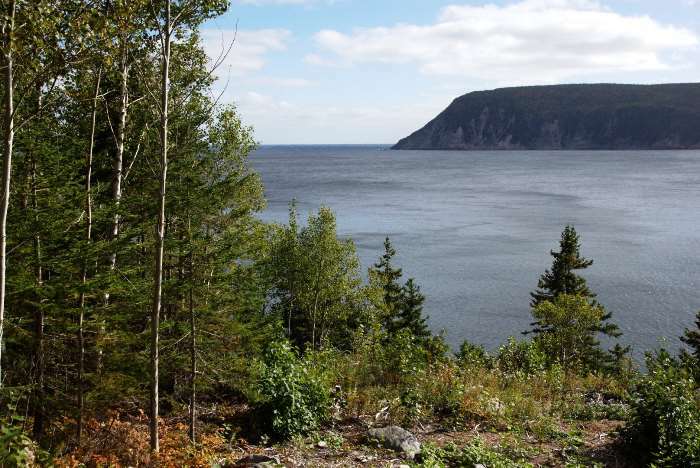 My first hike in Cape Breton National Park was a great one: not too long, not too short, not too steep, and not too scenic. Oh wait, everything except that last one. The scenery is bountiful on this peninsula that separates one ocean bay into two. Part of it is a loop, so you’ll have an alternative on a portion of your return trip. 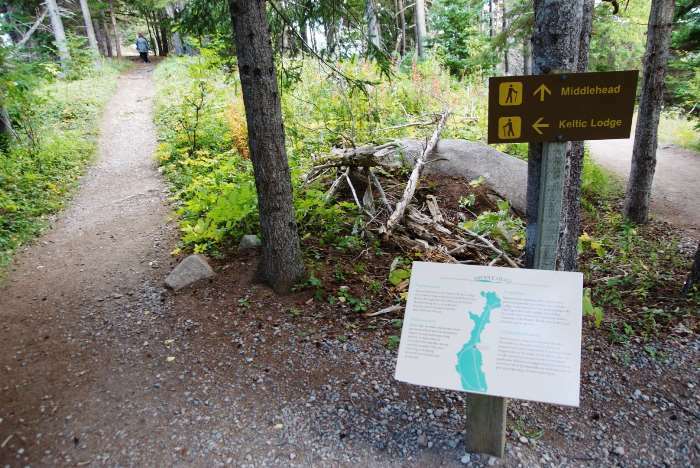 And, you’ll probably be able to finish the 3.8 kilometer (2.4 mile) hike in about 90 minutes or less. Middle Head is easy to spot on a map. 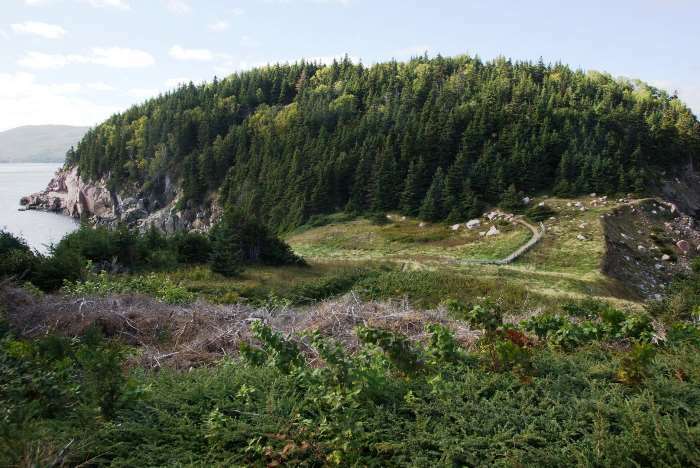 Just look for the narrow strip of land sticking out towards the east, near the community of Ingonish. 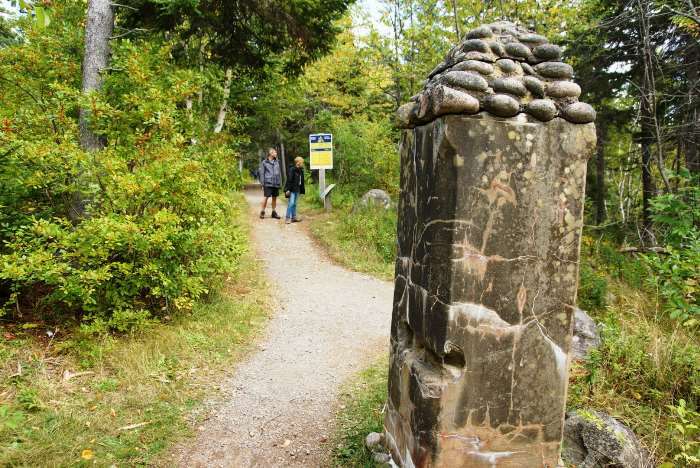 You’ll enter Cape Breton National Park just south of the turnoff to Middle Head and the Keltic Lodge at the Highlands — so make sure you purchase a park pass. 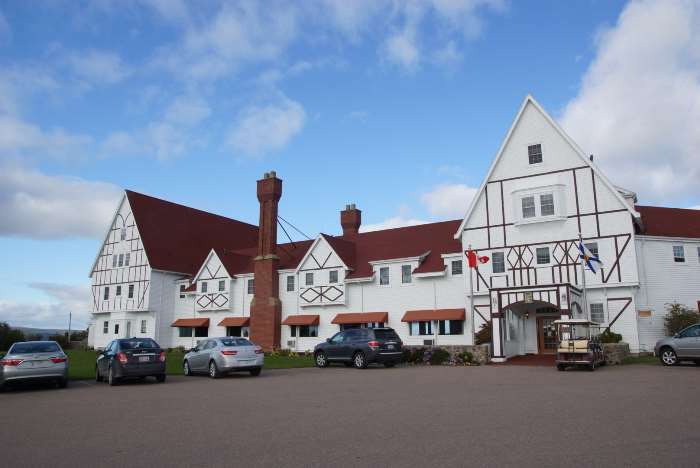 Before you get to the trailhead, you’ll drive by the Keltic Lodge at the Highlands. This would be an excellent place to stay — not only is it close to the Middle Head Trailhead, but other trails in the park are also nearby. The location (and the excellent view) doesn’t come cheap, though. When I checked summertime rates, I found rooms starting at around $200 per night. 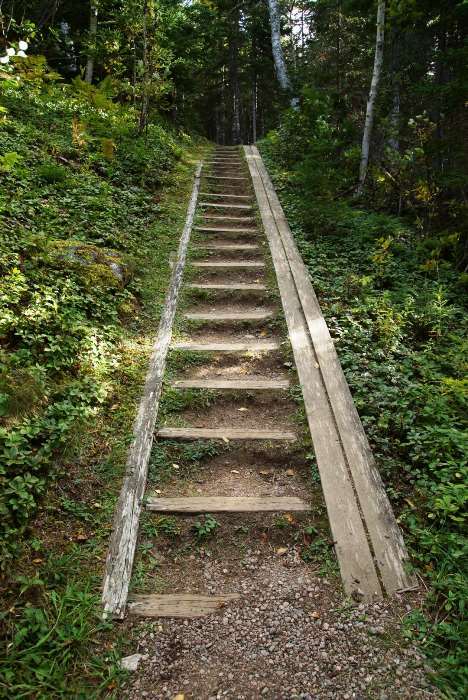 … and you’ll find the start of the trail. It’s marked by a couple of these concrete pillars, which must have, at one time, been a part of something more elaborate. 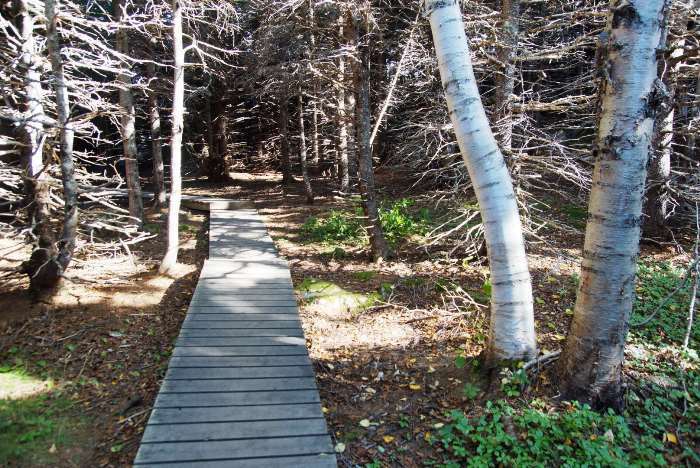 Along the trail, you’ll be in the woods at times, but you’ll also catch glimpses of the water and the coast. That’s Smokey Mountain out there to the south. In a couple of places, you’ll reach a clearing, and the peninsula is narrow enough that you can see both sides from the same spot. These clearings were quite windy on the day I visited. … and there’s the trail, not far from the edge of the cliff. Of course, there are less exciting views, but the shaded portions of the trail don’t last long. … and north again. 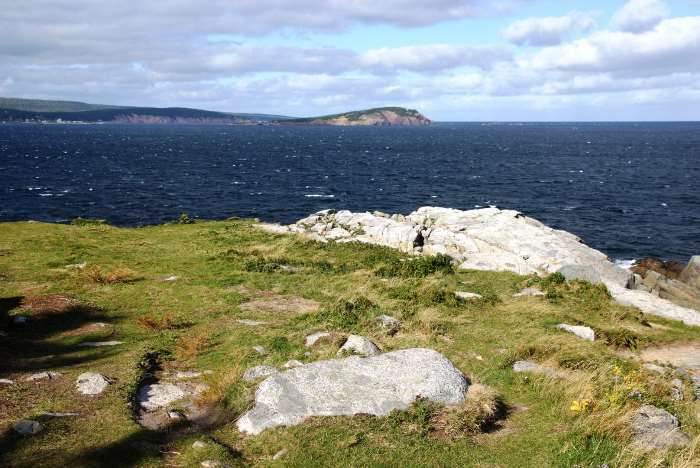 You can also look directly east, but all you’ll see is the Atlantic Ocean. 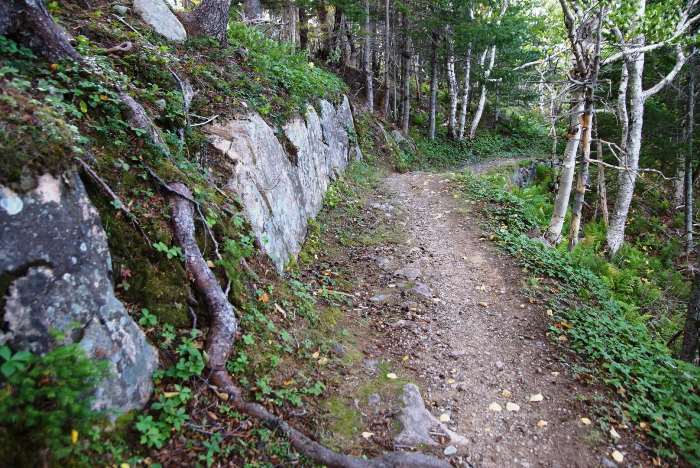 … until I reached this fork in the trail, and took the alternate route. … and this staircase. A few spots like this one were the only things even remotely challenging about this trail. I got back to the car in about 1 hour, 20 minutes. I’m sure you could do it faster or slower. 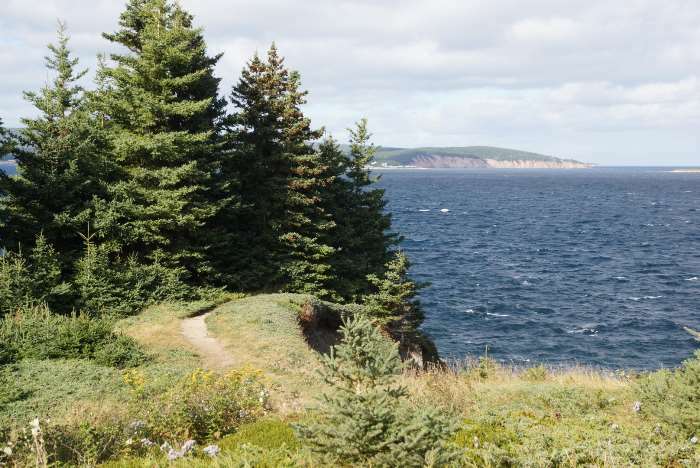 I highly recommend you find time to hike the Middle Head Trail while you’re visiting Cape Breton National Park. 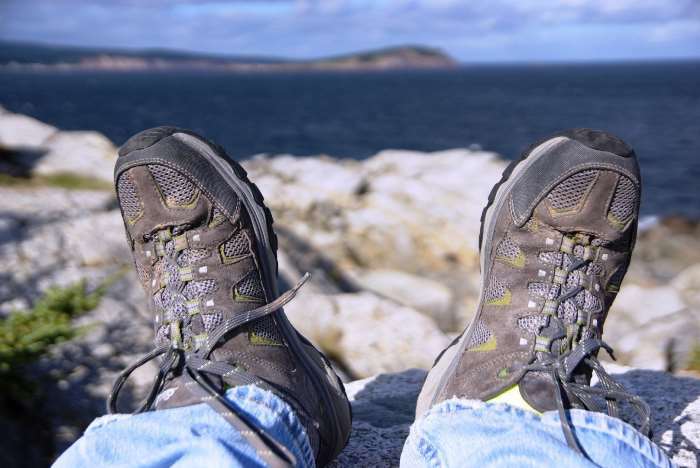 It’s a quick, easy walk that can kick you into hiking mode, or get you warmed up for a longer journey. The views are excellent. Bring an extra layer in case it’s blustery out there.